The Chinglish Files by olr: Go where? They -pend billion- of dollar- and forget the "-"! I mean it: 加some real油! P.S. Big -ign, to be found everyhwhere at Terminal 3. Aber was anderes kann man dazu übersetzen? Wie auf Deutsch "gas geben"? Ich liebe gerne "fighting". I saw some bad translation between the german and spanish languages, but theses are top-level examples. stupid example, maybe they dont forget it and it still makes sense! There, thank you for your good idea of creating this blog to point out those mistakes. Bad translations are quite headache things~ Good job! Is it possible you give a better translation? Die Web Seite ist sicherlich sehr hilfreich für uns (Chinese). Danke für deine Bemühung! und viel Spass in Beijing. check this out my friend, a label sighted in a beijing supermarket, "干果区", you should know the meaning, it's all about nuts. but the translation says "f*ck fruit area", haha, what you gonna do? i escaped. haha, i like it! like "how are you?" - "怎么是你？" and "how old are you?" - "怎么老是你？"
hey, man. this site is wonderful. i cannot help myself laughing. Hi, i love here, a good place for learning the accurate english. thx a lot. one more thing, there is an online translation site by which almost every chinese uses to translate chinese to english for their work. Could u have a test on that to see whether it's good? Ich bin Chris ...Ich komme aus Hong Kong .. ich lerne eutsch ..
ive registed just now for leaving comments on your blog..
i was really impressed for what youve done, thank you. translating is quite a huge difficulty for us and its been many many years. people work hard on it but funny "chinglish" still shows up everywhere. some people say its cute, i say its embressive. Don't be silly. 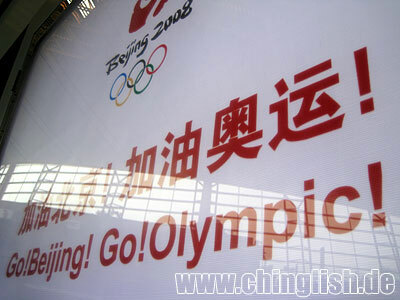 GO Beijing is right translation. i'll learn how to avoid these bad translation such as "investigation<-->调查" although these are really fun. You name(Chinese name) also is great! Bad chinese sentence, bad english sentence too. Go for what ? I don't understand this posting at all. The translation was perfectly fine. How else are you suppose to translate that?